I decided to tackle this hill last weekend as it's one of the southermost in the range and closest to where I live. It is somewhat confusing that there are two Oughtmores in the Sperrins: this is the lower and further south of the two. Came with the dog and Discoverer Map 13 - without it I probably never would have even known where it was exactly. Probably the best approach is to head north for several miles off the main Cookstown-Omagh Road, shortly after the turn off for Wellbrook Beetling Mill coming from C'town direction (you seriously will need a map/GPS as even explaining the route is difficult!). Looks like I parked at the same place as thisbliss: the forest comes into view on the left and there are two tracks opposite and just after a large white house. The left one is surfaced and leads to some old farm buildings and the right, which I took, is an unsurfaced forest track. I followed this for a short time until the start of the forest where there was a wire fence on the right. I walked up along the left side of the wire, easy enough to find a path but quite tough going as you're knee deep in heather most of the time. 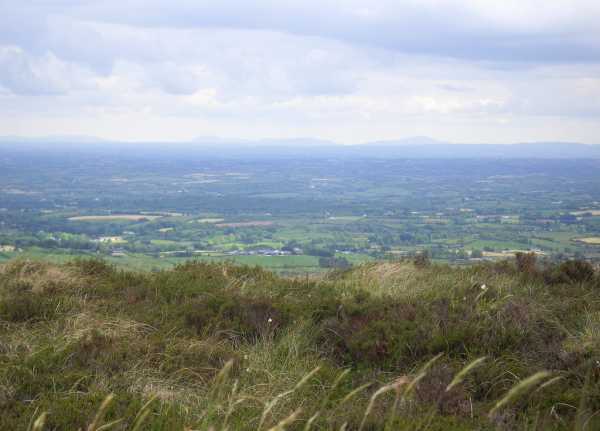 There are some fine views south and east here: Slieve Gullion, Camlough Mountain, Foye and the full length of the Mournes were clearly visible. Eventually, once you've reached the top of the forest, the wire turns at a right angle and I followed it to the west for some time, sandwiched between the line of the forest to the left and the wire to the right, until I came to a gate over the main forest track. I climbed over this and followed the track where it forks off to the right towards the summit, a pretty straightforward hike. There is a very small cairn at the peak from where there are stunning panoramic views considering the relatively small height of this hill: besides the ranges already mentioned, I could see Slieve Gallion and part of Lough Fea to the north east, Cookstown, the full length of Lough Neagh and the Belfast Hills to the west; most of the Sperrin range to the north and north west (Sawel and Dart were very prominent); distant peaks that I guessed were the Bluestacks of Donegal; to the south west the table-like profile of Cuilcagh could be seen as well as the south Tyrone/Fermanagh hills such as Brougher, the upland between F'miletown and Fintona and Slieve Divena wind farm near Garvaghy. Coming down I returned to the gate and this time followed the track straight down through the forest, which was quite an enjoyable if slightly eery walk; there were some deserted old farm buildings pretty deep in the forest. Eventually I came back to where I had branched off to follow the fence.